Book 1/30 in the 2012 Reading Challenge. Date completed: January 15, 2012. 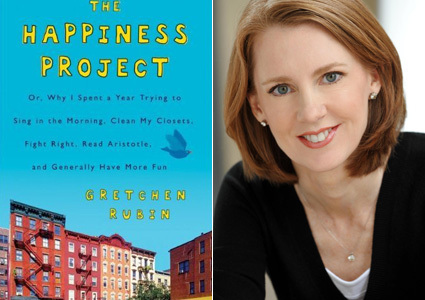 Gretchen Rubin's The Happiness Project was the perfect book for me to read at the start of a new year. Uplifting and optimistic, Gretchen details how she spent a year making and combining various resolutions to expand on her happiness. Each month she focused on a different aspect of her life and carefully thought out resolutions that she could apply to her daily life. The book is basically the reflection of how things panned out for her. I believe a friend recommended this book to me a while back and I sort of shrugged it off. Then I started seeing it on Pinterest. Again mostly shrugged it off. It wasn't till I was standing in the airport in our home town waiting to board the first flight out of our Christmas vacation at home with our families and into our newest adventure in the UK that I picked up the book at the newsstand from the bestsellers shelf. That was December 29. I dove in as soon as we were airborne. The Happiness Project doesn't exactly read as a "self-help" book. Nor does it truly feel like a "how-to" guide. It's more a concentrated memoir of sorts. I enjoyed the format quite a bit. I said to myself several times while reading it that it couldn't have been better timed for me - the new year hanging over us, the new adventure, and the bittersweet month we'd spent re-familiarizing ourselves with our families from whom we were so long detached... It was certainly a good time. I felt like the book was really speaking TO ME because I had such mixed emotions on December 29 about the road (or skies) ahead. However, I only gave The Happiness Project something like two stars. It wasn't my favorite book. I found Gretchen to be a bit annoying at times, though I can't pinpoint why exactly I felt this way. Parts of the book I very much enjoyed, other parts I just found to be so-so. For example, I felt like most of the mentions of her husband were very blah. It could be just her writing style but I kept getting irritated by his personality. I wanted to shake her up and tell her to dump the loser. But at the same time she kept talking about how wonderful he was and how she needed to cut him more slack. I guess I just don't really subscribe to the doting, obedient, overly-serving wife ideal. Maybe I should. But I immediately assumed she was extremely religious and then in a later chapter she goes into how she isn't, actually. So I think that threw me off, too. Minus her husband, I'd probably have rated the book higher. Reading back over that sentence it seems unfair but I can't help it. It's not a book I'd recommend to everyone I met, but certainly I'd recommend it in some cases. And I will say this: it was inspiring. Made me want to sing in the mornings (which I now sometimes do) and clean out my closets (which I admit I pretty much enjoyed before, too).